Background and Objectives: Management of postoperative pain after laparoscopic segmental colonic resections remains controversial. 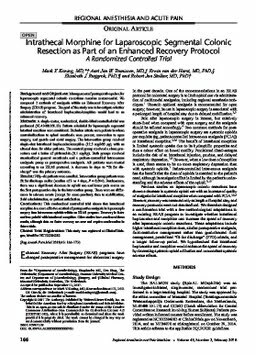 We compared 2 methods of analgesia within an Enhanced Recovery After Surgery (ERAS) program. The goal of the study was to investigate whether administration of intrathecal bupivacaine/morphine would lead to an enhanced recovery. Methods A single-center, randomized, double-blind controlled trial was performed (NL43488.101.13). Patients scheduled for laparoscopic segmental intestinal resections were considered. Exclusion criteria were patients in whom contraindications to spinal anesthesia were present, conversion to open surgery, and gastric and rectal surgery. The intervention group received single-shot intrathecal bupivacaine/morphine (12.5 mg/300 μg), with an altered dose for older patients. The control group received a sham procedure and a bolus of piritramide (0.1 mg/kg). Both groups received standardized general anesthesia and a patient-controlled intravenous analgesia pump as postoperative analgesia. All patients were treated according to an ERAS protocol. A decrease in days to "fit for discharge" was the primary outcome. Results Fifty-six patients were enrolled. Intervention group patients were fit for discharge earlier (median of 3 vs 4 days, P = 0.044). Furthermore, there was a significant decrease in opioid use and lower pain scores on the first postoperative day in the intervention group. There were no differences in adverse events (except for more pruritus), time to mobilization, fluid administration, or patient satisfaction. Conclusions: This randomized controlled trial shows that intrathecal morphine is a more effective method of postoperative analgesia in laparoscopic surgery than intravenous opioids within an ERAS program. Recovery is faster and less painful with intrathecal morphine. Other studies have confirmed these results, although data on faster recovery are new and require confirmation in future trials.